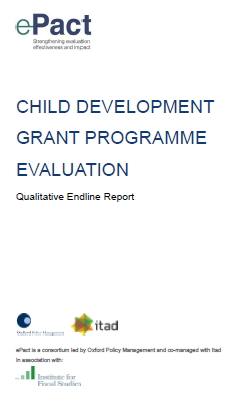 This report presents the findings of the third and final (endline) round of qualitative fieldwork for the evaluation of the Child Development Grant Programme, conducted in late November and early December 2017. Building on the previous research rounds, the field teams revisited the same seven selected beneficiary communities across the five LGAs. Within these themes, the endline particularly focused on two issues highlighted by the midline findings: causal pathways underlying adoption or non-adoption of exclusive breastfeeding, and the effects of the cash transfer on the incomes and assets of beneficiary women and their husbands. The qualitative endline also explored the implementation of the CDGP in the selected communities, focusing on beneficiaries’ experience of the exit processes.